Once again, we are taken by the infinitely fertile minds of the Buntport ensemble, where a real life chance encounter seeing Tommy Lee Jones alone in line at a Santa Fe Opera production of La bohème turns into an astounding and heartwarming piece of theatre. 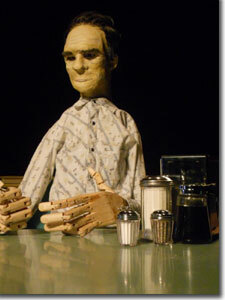 A near life-size puppet of Tommy Lee sits, lifelessly, at a table in a diner, we assume to be in San Saba, Texas, near one of his ranches, not far from where the actor was born. Across from him sits a mysterious figure, in a black jump suit with a hood that includes screening over the face. The lights dim, an operatic overture fills the theatre, and, one by one, enter the actors who will animate Tommy Lee's Left Hand (Erin Rollman), Right Hand (Evan Weissman), and, to great fanfare, his Head (Brian Colonna), wearing matching black jump suits, just like that of the mysterious figure, who turns out to be the Voice (Erik Edborg). 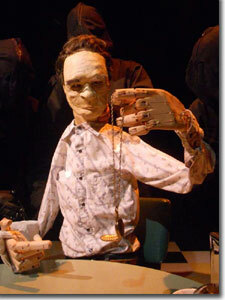 This is no ordinary puppet. The hands were carved by Kagen Schaefer, a Denver wood artist extraordinaire, and mechanized by Corey Milner, a talented local robotics teacher. The head was a group effort detailed by Rollman. The coordination of Tommy Lee's gestures and actions—including opening and closing a musical pocket watch that plays arias, plus eating a piece of pie and drinking coffee, rolling his eyes, walking, etc.—is reminiscent of the equines in War Horse, which required three people to bring each of them to life. Jones' fourth-wall monologue—astounding in scope and maturity, and genuinely humorous—covering everything from the pie and philosophic musings on life to the finer points of Puccini's operas, is interrupted by occasional forays back to three-wall artifice, where he and the waitress, Jane (Hannah Duggan), trade small talk as well as high-brow speculation on possible endings for Turandot, which Puccini famously never finished. 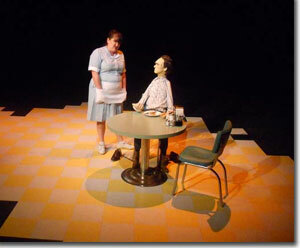 Edborg's does great emotive work as the Voice, well nuanced, with just a twinge of Texas twang. Despite his rapture over Rudolpho's arias and the adaptations of melodies from La bohème into hit songs in the '50's (great pantomime by Duggan on "Don't You Know?," a big hit for Della Reese in 1959), Tommy Lee is most fond of Turandot, since it has the most potential to be different every night, which is a clue that the ending of this piece is going to be a total surprise. As usual, the Buntport players find wonderful low-tech solutions to enthrall and surprise us; for example, Jane explains in detail the plot of Turandot using the silverware and the condiments at Tommy Lee's table. We'll avoid a spoiler alert and let you try to imagine how this might go. 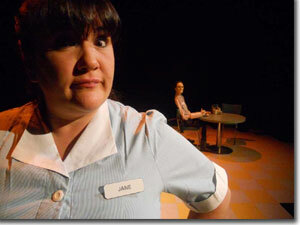 Buntport Theatre's world premiere of Tommy Lee Jones goes to the opera alone runs through April 15th. 720-946-1388 or www.buntport.com.